Peter Cushing is Victor Frankenstein in the average third entry to Hammer's Frankenstein series. From Universal R1 Hammer boxset. Hammer were in a slump in the early 1960s, their big budget Curse of the Werewolf (1961) and Phantom of the Opera (1962) has lost money, and many of their key staff had left the studio. After shooting a few low budget thrillers they wanted to return to their original, and most popular format - the gothic monster horror. For this third film in the Frankenstein series, Hammer made a co-production deal with Universal Films - creators of the original 1931-45 Frankenstein series. This meant that the pains taken to avoid copyright violations in the first two films were no longer necessary, and this is evident in both the design of the creature and the storyline. The film has no direct links to the previous two in the series, writer Anthony Hinds starting the storyline anew, and although this seems strange, it was a whole five years since the previous film and audience memories were shot without TV or video releases to refresh them. The storyline is pretty standard for a Frankenstein film and seems to be partly based on Universal's Son of Frankenstein (1939). Pacing is pretty average and the film doesn't drag, the climax is big, and a wonderful reference to the old Universal films. However, the plot is full of holes and flaws: While Frankenstein's assistants in the first two films had strong motivation to help the Baron, Hans merely seems to be the generic assistant, there for the good of the storyline. Zoltan's revenge on the town leaders seems very over-the-top since their crime seemed to be nothing more than asking him to leave town, Ygor's revenge in Son of Frankenstein on which it is based, is on men who sentenced him to death. Finally, Victor losing his temper when he sees the burgomaster wearing his ring seems to be completely out of character. 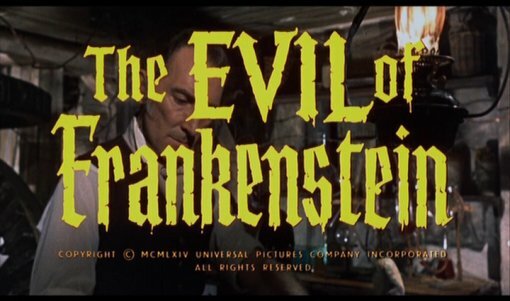 This was the only Frankenstein series film not directed by Hammer mainstay Terence Fisher - instead, Freddy Francis was brought in for the role. His camerawork is not as good as that of Fisher, preferring short cuts instead of long held shots - but he does bring some interesting camera angles into play, and there is a very good sequence in the flash-back creation scene where the creature's electrical cage is raised upright, all viewed from a camera placed on top of the cage. As with the earlier films, the frame is always filled with fantastic looking sets, from the highly elaborate laboratory to the abandoned house and the village. Music is by occasional Hammer composer Don Banks - his score more like that of the Universal films than the earlier Hammer pictures. The film's main problem comes with the design of the monster. Finally allowed to produce a creature similar to the famous Boris Karloff design of the Universal series, the monster is block headed and shuffles along in inexplicably massive boots. However most of the time it resembles a cheap paper-mache version of the classic design, and wrestler Kiwi Kingston behind the mask is completely unable to perform any facial movements. The use of a non-actor means that gone are the wonderful 'awaking into a new body' performances that gave a backing to Curse and Revenge. Hungarian actor Sandor Eles gives a relatively uninspired performance as Hans, and young actress Katy Wild is unable to perform much as the mute/deaf girl. Only Peter Woodthorpe as the drunk, crazed Zoltan threatens to steal scene from Peter Cushing, but he is not in the film for long enough to have much of a chance. As it is, Cushing's performance as Victor is forced to carry the film, and although there are a few standout scenes, the script limits him severely and it stands as one of his less impressive performances. The film has been much maligned before, and it does suffer from a bad looking monster, and relatively average performances from most of the cast - however the plot is acceptable and the production values are very good, making the film more than watchable, although one of the weakest in the series. Directed by anyone interesting? Freddie Francis - Occasional Hammer and Amicus horror director who went on to be cinematographer for a variety of big Hollywood films, including Dune (1984) and Glory (1989), for which he won an Oscar. Is it scary? Not really. Fans of the series should check this out, but not recommended. Good soundtrack? Don Banks gives a decent Universal Frankenstein style score. The picture quality is good, some very light grain throughout and some speckling in many scenes. Availability Only available as part of the Hammer Horror Series boxset. Cuts? Believed to be fully uncut. Print used is English language. An alternate verison of the film was shown on TV in the US with some addition scenes shot, but these are not shown here. A good quality release with great visuals and audio, the lack of extras, not even a trailer, is annoying. DVD Rewind DVD version comparasons. See the rest of the films in the Hammer Frankenstein Series and find more Frankenstein Films. Find more films by Hammer Studios and other films starring Peter Cushing or directed by Freddie Francis. Hammer Horror Series Boxset - information on the rest of the films in the set. All text in this review written by Timothy Young - 23rd January 2006.